ALAMOGORDO, N.M. — Twenty years ago, long before SpaceX and Virgin Galactic entered the commercial space scene, a towering rocket that looked like a parking cone held the promise of opening up the heavens for the masses. The DC-X reusable rocket was built was built by McDonnell Douglas, a company that later became part of Boeing, but the rocket experiment wasn't entirely a commercial project, as it was carried out under the U.S. military and later NASA. Nonetheless, DC-X has taken on a legendary status in the burgeoning private space community because it accomplished a feat that still proves challenging today — showing that a reusable launch vehicle could be prototyped on a relatively low budget and flown over and over again. Recent wet weather has made this southern part of the state unusually green, a reminder of the downpour that struck ahead of DC-X's first flight on Aug. 18, 1993. 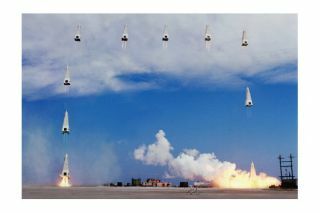 The storm flooded the launch site at nearby White Sands Missile Range, but instead of postponing the test flight, the team, led by former Apollo astronaut Pete Conrad, decided to press ahead, DC-X veterans recalled. "Pete Conrad was out there with the rest of us digging it out and getting it dry," said Bill Gaubatz, the program's manager at McDonnell Douglas. "We were the first to land on Earth with a rocket system," Don Steinmeyer, the program's chief engineer, told SPACE.com. "That was the big issue — whether you could physically do that or not — and that’s what we accomplished." The DC-X crew nicknamed themselves the "hoodlum team" after a snub rumored to have been lodged at them by a NASA official at the time, Steinmeyer said. They scrounged largely existing technology to build their prototype and had it flying just 24 months after McDonnell Douglas won a $60 million contract to build the launch vehicle from the Department of Defense's Strategic Defense Initiative — a Reagan-era precursor to the Ballistic Missile Defense Organization that was looking into space-based defenses at the time. In 11 more flights, DC-X and an advanced iteration of the vehicle called DC-XA demonstrated that a quickly built, low-cost reusable launch vehicle could possibly deliver payloads into space without being carried there by a rocket that would be cast off and burned up in the atmosphere after doing its job. "It is the Sputnik of the commercial space race," Chris Rosander, who was the senior marketing manager of the Delta Clipper program, told the group here. DC-XA toppled over and exploded during its last flight due to a landing gear failure and was left heavily damage beyond repair. By then, the reusable launch vehicle program was in the hands of NASA. Though a planned, scaled-up prototype of the vehicle dubbed DC-Y would have been capable of reaching orbit, the space agency abandoned the project efforts in favor of X-33, a Lockheed Martin concept that never ended up flying. Years later, DC-X still serves as an inspiration for private spaceflight companies that are still trying to meet that goal of low-cost reusable spacecraft, like entrepreneur Elon Musk's SpaceX. The anniversary of DC-X's first flight came just days after SpaceX's prototype Grasshopper rocket — a 10-story vertical takeoff and landing vehicle — completed a test leap in Texas that looked uncannily similar to DC-X's maiden flight. The Grasshopper rocket launched high into the air above its McGregor, Texas proving grounds and flew sideways for the first time on Aug. 13. On Saturday (Aug. 17), hours before dozens of the DC-X team members were inducted into the International Space Hall of Fame, Jess Sponable, an Air Force program manager for DC-X, showed the group an email he received from Musk. In response to congratulations on Grasshopper's latest milestone, Musk wrote, "Thanks, Just continuing the great work of the DC-X program!"